Ever since the Romans invented baths, people have enjoyed the indulgence and feeling of rejuvenation provided by a hot spa. Now you can enjoy what was once an occasional luxury everyday of the year in your own garden. Comfortably seating up to 3 people, the Quebec offers powerful therapeutic seats, along with subtler yet invigorating options. The lounger provides a full-body hydro-massage with jets targeting legs, calves, feet, back. This elegant model leads the way in innovative design and spa-therapy. For the best built spas in the world with innovative design, quality assurance and precise engineering a Canadian spa ticks all the right boxes. Your private retreat is finally within reach. Our exclusive spas are designed to work efficiently to save you time, energy and money allowing you to enjoy your spa for pennies a day. It all starts with the shell, which is designed with a triple layer dura bond process with a timber reinforced frame to create the strongest shell in the world. Each spa is designed using support beams which support the cabinets under structure to form a seamless unified system. Insulation is a key component in the Canadian spa company design. We use full foam insulation for maximum heat retention whilst lowering operating costs. Our thermal reclamation system ensures recycled heat from the motors can pass directly into the water. Our innovative pump pushes water through your spa plumbing and out through your spa jets. It has been specifically adapted to boost performance in your spa system using over-sized piping around the intake to ensure a powerful massage using less energy. Canadian spas all come equipped with a 3Kw heater which works seamlessly with the tough insulation package to ensure your spa retains and gains heat quickly even in the harshest Canadian winters! When not using your Canadian spa hot tub just put the UV protected cover into place to retain heat, lower operating costs and protect your investment from whatever the weather can throw at it. The tapered design allows for easy run off for rain and snow to protect your spa from pooling damage. All the spas incorporate a unique pressure point system, which delivers soothing water to specify points on the body. If you suffer from a sore neck or shoulders, many of our spas have a unique moulded neck support with recessed neck jets, which create a truly invigorating experience. Additionally, across all our spas, various types of jets allow you to massage different muscles with different water pressure. Air control means you can adjust the jets - form a soft gentle massage to a more vigorous work out. 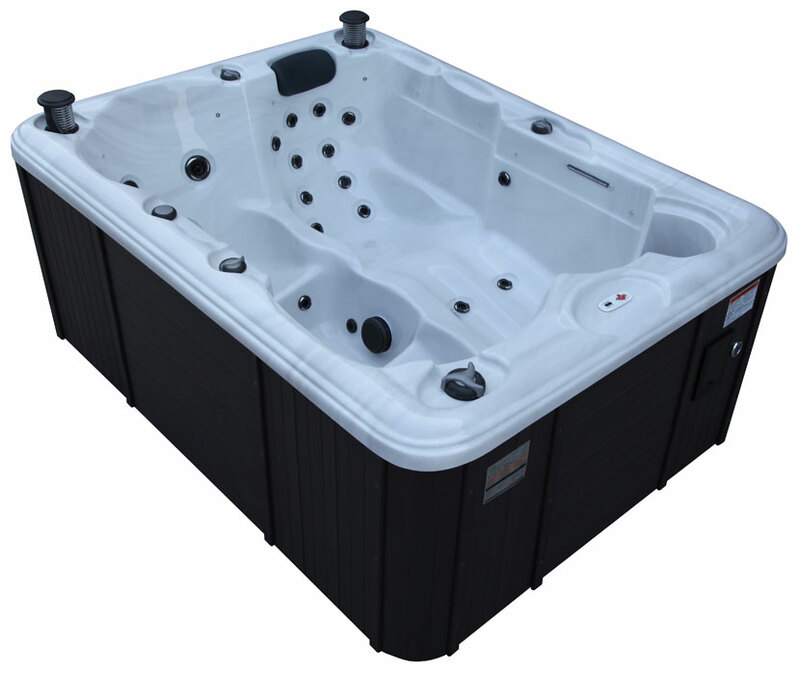 All spas have easily adjustable jets - the proven efficiency of this jet system assures you reliable performance that you will enjoy for years to come. The ozonator is half of the mountain pure advanced auto filtration system. This feature provides the best in class water sanitation with minimal chemical usage. The ozonator purifies with ozone to provide a longer product lifecycle and contribute to a cleaner environment. We uniquely use a Mazzi Slow flow ozone system to maximise exposure of the ozone to the water and increase effectiveness. The other half of the Mountain pure system is a semi permeable membrane filter. Our easy access reusable filters keep your water fresh and sparkling. When desired changing the water couldn’t be easier with a cabinet accessible drain valve, just unscrew and you’re good to go. For comfort look no further. Our seats are ergonomically designed to cradle the body and the high velocity jets create a highly customized hydrotherapy massage on demand. Each seat is contoured to the body’s natural posture and the jets are positioned to target specific muscle groups for maximum therapeutic results. In fact every jet can be opened or closed to accommodate your hydrotherapy preference. Directional jets can also be positioned to give you a personal massage in exactly the right place every time. 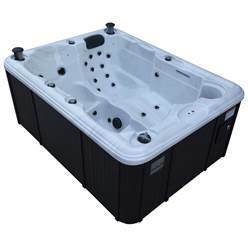 The hot tub has 2 integrated slow rising waterproof retractable speakers and built-in high fidelity amplifier delivering high volume with clear acoustics which alongside the LED lighting set the mood for any event be it relaxing or partying. The 3.5 mm AUX connection sockets compatible with iPhones, iPods and most MP3 players (standard headphone jack) and dedicated waterproof compartment mean that you can play all of your favourite songs without the fear of damaging your phone or MP3 Player. We have introduced an unrivalled lighting system so you can truly experience the effects of the northern lights right there in your spa. A powerful underwater led light coupled with perimeter lighting and cascading led waterfalls ensures that your night-time soak is as bright affair to remember. Total control over your hot tub features such as lighting, temperature and jets is all at your finger tips with a convenient top side control panel. Plug and play means that there is no additional electrical installation required to set up your spa. These hot tubs plug into a normal wall socket to offer customers an 'easy-to-install' solution without the need for an electrician. Attached to the plug is an included RCD to protect the spa and the electrical circuit. Be sure that the spa is the only load on the circuit when plugged in. The massaging action of a spa will accelerate the healing process of aches and pains. Warm, swirling water reduces stress and allows you to rest, giving you a better nights sleep by refreshing your body and mind to tackle the next day. Painful or inflammed joints can cause muscles to tense in an effort to protect them. Warm water and hydrotherapy help relax the muscles and allow a greater range of motion in the joints. Pain is often reduced even after leaving the spa. When submerged in water your body is about 1/10 its normal weight. buoyancy is a key element of relaxation and stress relief. it helps overcome the effects of gravity and relieves stress on the joints. Exercising can cause microscopic tears in the muscle and lactic acid build up. The warm massaging action of spa will accelerate the healing process allowing lactic acid to be carried away from the muscles. As muscles relax and pain eases you move more easily. Warm water reduces tension and allows you to rest and get a better nights slepp. Sleep deepens as body temperature drops. Experts recommend that people who suffer from sleeplessness soak in a spat at 36ºC to 40ºC (97ºF to 104ºF) for 15 mins before bedtime. Endorphins are natural painkiller for the body. Warm water stimulates their release When the body is in warm water, blood vessels near the skin relax. Multi-level seating - different jets provide a new spa experience in each position. Body contoured lounger shaped for comfort and support so you can lay down and really relax. Powerful water pumps ranging from 2HP to 10HP. Electronic control pad - for controlling temperature, filter cycles, water jets, air jets and lights. Heater to keep your spa at a constant 40ºC (104ºF). Hard top tapered cover with 8 straps, 6 handles and a fully hinged steam seal. Cover is custom fit to minimise operating costs and maintain maximum safety. Ozone cleaning system. An ultraviolet light system acts to automatically ozonate the water at regular intervals, which disinfects and kills bacteria in the water. Interactive jets can be easily manipulated to blow heated air and heated water in varying combinations for different effects of massage. Aromatherapy unit. Built in unit as part of the hot air blower system or on its own to capture the power of scent to enhance relaxation and improve your overall state of mind. Steps for easy access to the Spa. LED light with changeable blue/red/green LED's to create the mood of your choice. Chemical kit to keep water clean and fresh. Integrated waterproof sound system compatible with iPhones, iPods and most MP3 players.